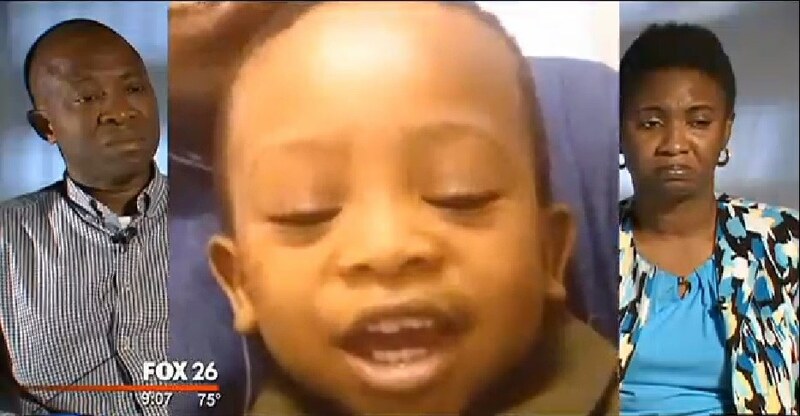 Earlier this year, in May of 2015, we reported on the story of the Giwa family in Houston, who had their 19 month old son medically kidnapped by Texas CPS. Randy Wallace of Fox News Houston broke the story. Ahmed Giwa, the father of 19-month old Ali, contacted Health Impact News and MedicalKidnap.com at that time about publishing their full story. This was the last statement we received from him by email in May 2015: "Currently waiting for the Police outside the hospital where they have our son because CPS said they should not allow us in. Let us schedule next week outside Monday please. The Police (are) here now." Multiple attempts to contact Ahmed and follow up after this email was received were unsuccessful, and we suspected that a gag order had been placed on the parents in an attempt to stop the media and the public from learning any more about their story. Both Ahmed and his wife Olubunmi have now contacted Health Impact News, and they want the world to know their story. Not only were they issued a gag order and told not to talk to the media, they were told they had to fire their attorney if they wanted to see their son again. The family had retained the services of Attorney Julie Ketterman in Houston, who has a history of fighting back against CPS and standing up for family rights. She has publicly stated: "CPS profits every time they place a child outside the home for adoption. It has stopped being a resource for families in need and has instead turned into an adoption mill." Will the people of Houston and Texas continue to allow these gross abuses of Constitutional rights to continue in their state? Philip said: > Speaking with an attorney, he said the agency officials are not well paid, inadequate training and overworked. They go to court house and lie at will and their target are toddlers it is all about the money and not the children. What happens is the county budget relies on the service's from DCFS. The county attorney knows this. Know when they see you can't afford an attorney they extend the case for 90 to 180 days? Well in that time DCFS will provide about a dozen services at lease. Giving them funding on each service they provide. Meanwhile parents come out of pocket and if for some reason parents can't afford to complete a service, DCFS needs to provide more services now. This is just a county funding scheme that this current president is in on plus the last president of the United States.. Now it's all FEDERAL FUNDING when you walk into the FBI with proof that DIRECTOR'S of DCFS broke countless felony acts and broke over sixty felonies on just one case out of the hundreds of cases this person has? They are still out in the field as a Field Adoption Supervisor, What does that tell you? This is the same person that has to meet to department's goal's for adoptions and services they provide. I put my life as to what I say is true I will bet my life that's how sure I am on this. Hidden Director of adoptions that works for CPS/DCFS they put the reports in for all the goals being made for their department. What goals????? KIDS being taken.....if any laws were broken don't you think the police would take the parent away? How can DCFS allow a parent to be guilty of abuse and not report this to PD? Well services... Can you say services one more time for everybody? SERVICES! Parent's must pay$ while DCFS/CPS collect! The main goal here everybody is? SERVICES for funding!!! Prove me wrong. I beg. It's a shame nobody on this earth can prove me wrong. A true complete shame for some adults to harm little babies and parents. The amount of pain being put onto another over money. I don't like DCFS' bad employee's, my name is Jason Vafai Janbahan, Sr. - anybody from CPS-DCFS feel free to contact me, we can talk any time. I have put a few reports already into DCFS for other people, that makes them just plain hate me even more. Well DCFS, "Your welcome," I will not stop, it's hard to stop when there's "so many cases" adults from DCFS break countless laws and hurt kid's then drive home to smile at their friends while people suffer from their actions. I don't find it funny and the people in their same town feel the same way. No more smile's this is not funny. Hello, The only way CPS can continue to work directly with the parent's is to get rid of the parent's attorney. Not good now CPS full court advantage. With false service's the parent's don't need. Are they really homeless? Have either parent ever been arrested for violance while with the other parent and children? With out authentication all I see are REPORT"S of none authenticated claim's? Mean while countless judge bench guide codes, felony penal code's and wic codes are violated. Please send me the CPS worker's name's or report them yourself. First the head DA of that county. Look up the laws in that county and look at the report's giving by cps. Fight fire with fire it may be your only chance. Or it become's the never ending story that your child will never understand. Thank god. How ever the pain for each parent is damage for ever. CPS right now doesn't care about this child. They only care if the parent's can afford to complete some classes while they provide service's. CPS gets funding for each service they provide while parent's are delayed with completeing and complying. With service;s they don't even need, forced upon this family for there love and care. CPS love's catching big fish? ME TOO. I am ne of the best angler's in the world. Send it my way....I love adult's that pick on family's and hurt kids they should meet me. I am there worst night mare. My name will live in there head for ever until they past. Send them my way. I live for this. I my self pray that there good people. Only good things come to good people. I wish i could tell you want happen's to bad people? I can't read the future. Only whish them luck..
Admin said: > Earlier this year, in May of 2015, we reported on the story of the Giwa family in Houston, who had their 19 month old son medically kidnapped by Texas CPS. Randy Wallace of Fox News Houston broke the story. > > Ahmed Giwa, the father of 19-month old Ali, contacted Health Impact News and MedicalKidnap.com at that time about publishing their full story. This was the last statement we received from him by email in May 2015: "Currently waiting for the Police outside the hospital where they have our son because CPS said they should not allow us in. Let us schedule next week outside Monday please. The Police (are) here now." > > Multiple attempts to contact Ahmed and follow up after this email was received were unsuccessful, and we suspected that a gag order had been placed on the parents in an attempt to stop the media and the public from learning any more about their story. > > Both Ahmed and his wife Olubunmi have now contacted Health Impact News, and they want the world to know their story. Not only were they issued a gag order and told not to talk to the media, they were told they had to fire their attorney if they wanted to see their son again. The family had retained the services of Attorney Julie Ketterman in Houston, who has a history of fighting back against CPS and standing up for family rights. She has publicly stated: "CPS profits every time they place a child outside the home for adoption. It has stopped being a resource for families in need and has instead turned into an adoption mill." > > Will the people of Houston and Texas continue to allow these gross abuses of Constitutional rights to continue in their state? I am gum smacked that this can be happening in America. If it can happen to these people, it can happen to anyone. I hope the CPS criminal cartel keeps it up. They keep shooting themselves in the foot and are going to be their own undoing. It does bother me though that none of these criminal kidnappers are likely to see a day in jail. Philip said: > Speaking with an attorney, he said the agency officials are not well paid, inadequate training and overworked. They go to court house and lie at will and their target are toddlers it is all about the money and not the children. I have sent emails. Called and left messages for Greg Abbott. No reply. This started in March 2015. It was for the Angel Cook family in Cleburne, texas. Cps has bullied this family over and over. They lied, filed false documents. The cooks have a wagon full of written proof. Her children were sexually assaulted and abused in the foster homes. They have been heard by the sunset commission who promised Angel and her kids that spoke before them that they would help. Nothing was done. Contacted Greg Abbotts office. NOTHING. Makes me sick that this agency is getting by with this. Murders get better treatment. There kids can come visit them in prison. I wish the Houston attorney wound contact the Cooks family in Cleburne. Just look under the sunset commission for angel cook testimony. You can go to many places even her fb page. She and her husband were accused of killing there adopted son . They want the records of the twins while *in vitro*? And these are the people who are micromanaging the parents? Speaking with an attorney, he said the agency officials are not well paid, inadequate training and overworked. They go to court house and lie at will and their target are toddlers it is all about the money and not the children.